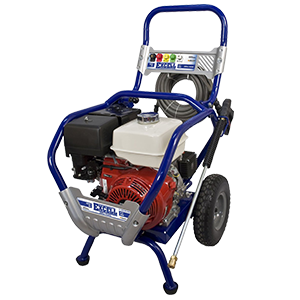 Excell 4000 PSI pressure washer features a powerful Honda GX390 OHV engine. Unit is also equipped with a professional tri-plex Comet pump. 12-Inch pneumatic tires allow for easy maneverability, and the high pressure hose extends a lengthy 50-foot for tough to reach cleaning projects. Excell PWZC164000 is a high torque producing pressure washer with which you can use to carry out a number of cleaning tasks around your house and even in job sites. Read on to know more about this pressure washer. It is a gas powered pressure washer that comes with 390Cc Honda GX390 OHV engine. The engine of this unit is capable of delivering a high pressure of 4000 PSI. With such a pressure, you will be able to do a lot of cleaning tasks under various environments. The unit offers users with amazing mobility, flexibility and stability. It stands on a two legs aided by two pneumatic tires at the rear side of the unit. The legs are strongly made with rust resistance metal material. The tips of the legs are covered with a rubber cap to reduce vibration and thus make the unit more stable as it is vibrating. For easy mobility, maneuverability and flexibility, the unit is equipped with rear tires. Just pull the unit by the metal handle and it will follow you easily. The tires are well threaded and thus they are able to maintain strong traction with the ground and can be used on a number of terrains. For convenience and ease of use, a high pressure hose of 50 foot by 3/8 inch is provided. With such a lengthy hose, users will enjoy extended reach. As it has been mentioned above, the unit can be used for cleaning a number of surfaces. 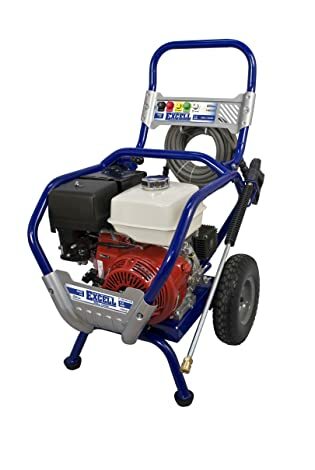 Given that the strength of various objects and surfaces that can be cleaned with the machine varies, Excell equipped this model of their pressure washer with 5 quick connect nozzle tips. Each is meant to be used on a particular type of surface. The tips are coded with color to make it easy for users to identify them and choose the one that will suit them best. The ergonomic wand to which the quick connect nozzle tip is attached to is rust resistant and thus it will last longer for you when you are cleaning with it. Every pressure washer has its strength as well as downside. Excell PWZC164000 is not exempted from this. However, as the pressure washer has not been reviewed for now in Amazon by any consumer, it is difficult to tell what its pros and cons are. However, given the fact that best Excell pressure washers are reliable, we hope that the pros of this model will outweigh its cons. Excell PWZC164000 is strongly made to tackle stubborn cleaning project and eliminate stubborn stains, oil, grease, debris and dirt even if they have been on the surfaces for years. When you want to buy a new pressure washer, it is advisable that you read reviews of different brands and models to know which pressure washer will satisfy your needs. We have taken time to review various products for you after a thorough research. So, don’t waste your time on the net looking for pressure washer review. Just come to our site and read informative reviews. Click here to read best pressure washer reviews and see available discount deals.